When I was single, my spending decisions were my own – I didn’t have a personal finance accountability partner. I didn’t have anyone to call me out when I went over my budget or made other poor financial decision. Yes, I solicited advice prior to making major financial purchases, like my car and home. I got professional advice on my retirements plans. I didn’t just jump in on the major stuff. But the advice I got was from people who only knew a small piece of my financial situation. It is hard to give adequate advice when you are only seeing part of the picture. Now that I’m married, Aaron and I discuss our personal finances on a regular basis. We review our budget regularly, we discuss major purchases, and we make joint decisions on retirement, college funding and other decisions related to saving money. 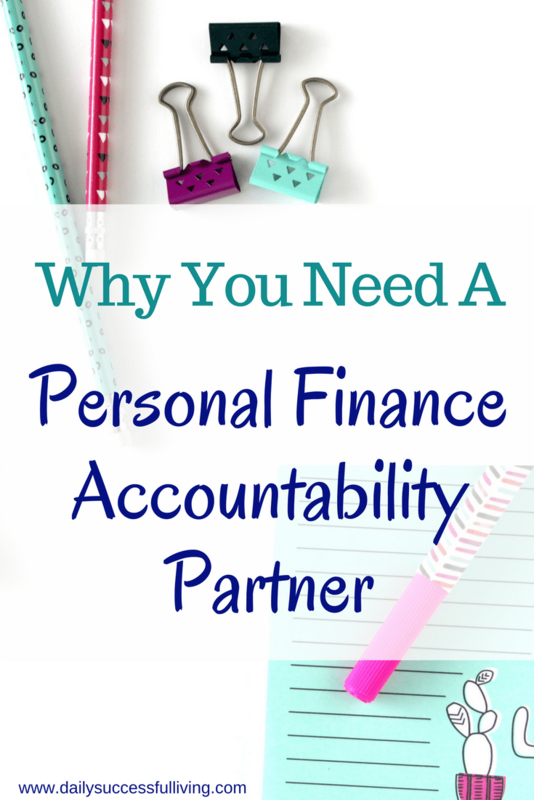 Having an accountability partner has made a huge impact on my personal financial decisions. There is something about talking through financial decisions that leads to a higher level of accountability. I find myself spending more time thinking through my decisions and reviewing different options. What is the definition of an accountability partner? In my opinion, an accountability partner is someone you trust to mentor you in your financial decision-making process. This person is someone who understands you and your spending habits. They are someone who shares your vision of the future and believes in your ability to succeed. This person knows how to lovingly correct you, while still holding you accountable. It doesn’t need to be a financial expert. Ideally, it is someone who knows you well enough to call bull when you make excuses for poor financial decisions. If you are married you should have a built-in accountability partner. I know this isn’t always the case, but hope that you and your spouse can resolve this issue. If you are single, it is a little bit more difficult to find an accountability partner. Ironically enough, I know of many friends who have found their accountability partners online. There are multiple groups on Facebook devoted to personal finance. There are worse ways to hold yourself accountable. Since you’re sharing intimate details of your personal financial life with your partner, you’ll need someone you trust. I share a lot of my personal financial information online and talk pretty freely about my income and expenses. I know that most people aren’t as free with this information, it is vital that you find someone who will honor the trust you are giving them. During my single years, my best friend Brooke and I talked about personal finance decisions all of the time. Looking back I wish that I had asked her to be a true accountability partner. If I had asked her to call me out when I spent too much money shopping she would have done it. I would have listened to her because I trusted her judgment. We are the type of dorky friends that probably would have drawn up an accountability partner contract – we would have gone full force and had a lot of fun with it. We would have both done a better job saving and managing our money. The reason it would have worked so well is because I have complete trust in Brooke. I know that she would have supported me, helped me and guided me. Most importantly, she would have honored our accountability contract and called me out on poor spending decisions. An accountability partner is worthless if they don’t hold you accountable for your actions. If they accept all of your excuses for overspending your budget, or worse encourage you to spend, spend, spend, you’ve chosen the wrong partner. A good accountability partner is someone who will call you on your bull. They aren’t going to accept your excuses. Just because the shoes are the cutest shoes ever, isn’t a good enough reason to blow your budget. A top-notch partner will find ways to encourage you and constantly support you as you work towards your goals. This is something that I have really grown to appreciate in my marriage. Recently, Aaron started spending money on a video game. I should mention he isn’t a gamer and this is the first time he’s done this in seven years of marriage. I talked to him about my feelings and we had a great discussion about our spending habits. We are both noticing a little bit of spending creep in the last year since we paid off all of our consumer debt. Check out my post on how we paid off $293,000 in consumer debt. I felt 100% comfortable confronting him on this issue. He listened to my concerns and we came up with a compromise. Which leads to my third point. You want a partner who listens to your hopes and dreams and uses your words against you when you are struggling. During our debt free journey, I remember calling my husband Aaron multiple times when I wanted to spend money. It wasn’t that I didn’t have the willpower myself, but hearing someone else remind me of why we were sacrificing, made the sacrifice so much easier. Sometimes all you need is someone to listen as you talk yourself out of the purchase. One of the biggest strengths of a good listener is the ability to help you determine if this purchase is a want or a need. Just because you want something to be a need, doesn’t mean it is. The important thing is to find a partner who will listen and support you. Personal financial success isn’t about the money. It is about your behaviors. I’ve known some very wealthy people who are living paycheck to paycheck. I’ve also known some very poor people who retire as millionaires. The people who get ahead financially live on a budget, save for a rainy day and prioritize planning for the future. It really is that simple. I’ve found that by discussing my personal finances with others, I’m able to gain valuable insights that help me make informed decisions. Having an accountability partner who knows my entire financial position and who I’ve asked to hold me accountable adds a whole new level of support to my life. If you don’t have an accountability partner, I strongly encourage you to find someone. If you are married, talk to your spouse and begin the process of reshaping your marital finances. I can promise that as your find ways of holding yourself accountable, you will become a better steward of your money. You will find staying on budget easier, you’ll save more money and make wise financial decisions. Most importantly, these decisions will lead to less stress and financial heartache in your life. This is a great read Amy. Thanks for sharing. I am going to share this with my friend. I need an an accountability partner! Yeah! I’m so glad it helped. I can guarantee having an accountability partner will help you succeed financially. I miss you and hope law school is going well!